In a fantastic push to support our Giving Tuesday initiative on December 3, many friends and advocates stood up to recognize The Messages Project. While this day of giving was promoted as just that — a day — our backers made it clear that giving to a cause such as ours should continue the whole year through. Here are a few wonderful examples. A group of communications specialists at a publishing firm in New Jersey decided to support The Messages Project in lieu of holding an annual gift exchange. 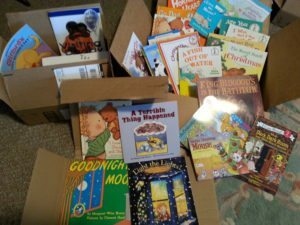 These awesome donors took the opportunity to make a bulk monetary contribution and personally select books for children of incarcerated parents, which we can use when filming at prisons in the future. Some were chosen directly from our Amazon Wish List, but most were picked out for the kids just because they had personal meaning to the donors. The Messages Project was also blessed with a huge contribution of books from our friends at Studio East Salon in Virginia. 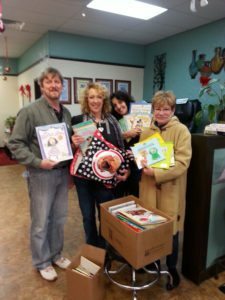 Not only did the salon workers take on their annual book drive to bring in donations from customers, but they also purchased books in lieu of a staff gift exchange. We are eternally grateful for their generosity. If you’d like to help us continue this inspiring season of giving, please visit the “How You Can Help” section of our site. There are many opportunities available for anyone to give back to their community through our program. Whether a monetary donation, book contribution, or volunteer hours are easiest for you to give, we are always in need of your dedication. Thank you so much for another wonderful campaign!